To many people including divers, Indonesia is a bit of a mystery. Sure they might know something of Bali or the Komodo dragons but most likely not much more. There is so much more to diving Indonesia. Indonesia is the largest archipelagic country in the world. It straddles the equator and extends 5,120 kilometers (3,181 mi) from east to west and 1,760 kilometers (1,094 mi) from north to south. Not only is the distance great, there are over 17,000 islands with the majority not inhabited. Indonesia provides much of the southern border of what the world’s scientist call the coral triangle, an area that has the greatest biodiversity in the world. Four world class destinations within the country are the focus for the majority of the international divers. These include Bali both land based and liveaboards, Komodo Islands Liveaboard and nearby resorts, Raja Ampat which is primarily Liveaboard diving , and Sulawesi liveaboards to remote sites. The selection of liveaboards in Indonesia is vast second only to the Red Sea. The selections also vary greatly in price range from less than $150 a day to over $1,000 a day. Raja Ampat is often included in list of the best dive destinations in the world. Being in the Coral triangle, It does have one of the highest biodiversity ratings. Some areas have never been studied leading many scientist to believe that the number of species in the area is much higher than those which have been verified. Considered one of the top remote diving destinations in the world, it is the only one suitable for beginning divers. While some of the best dive resorts in the world are located in the area, diver should consider taking a liveaboard to extend the range of sites that they can visit. Bali is likely the best known of the diving destinations in Indonesia with a number of word class dive sites such as the Liberty ship. There are three diving destinations around the large island, however, any of them can be reached in a few hours drive. Many divers enjoy a week of diving around the islands then add a trip on a liveaboard to some of the more remote islands and liveaboards. Some Liveaboards sailing to the Komodo Islands depart from here. The Komodo Islands and the Komodo Islands National Park is one of the popular diving destinations in the country. The diving is diverse and offers dive sites for most level of divers. There are no dive resorts located within the National Park however dive resorts from nearby islands do visit the islands. Most of the dive resorts are not pen year round as sea conditions can become to rough. The liveaboards however can dive year round. They simply adjust their itineraries to account for the season changes in currents. The towns of Labuan Bajo in the west of Flores or Bima in eastern Sumbawa are the departure point for many of the liveaboards with Bali also sending liveaboards to the area. Sulawesi formerly called the Celebes is the world’s eleventh-largest island and has a population of 18 million people. However the number of uninhabited islands and the vast coast line make this a remote diving destination. 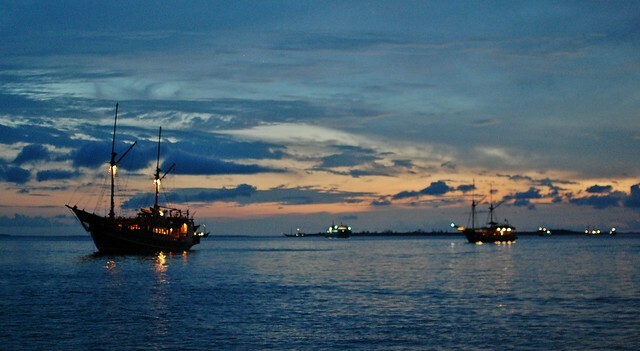 It does not take long for liveaboards to venture into the Sulawesi sea and leave civilization behind. Divers will find pristine dive sites, excellent marine life and perfect photographic opportunities for creatures large and small. Many professional underwater photographers rate these liveaboard trips as the best locations for expanding your underwater portfolio.